Gosh, I don’t know if this is my “find of the week.” It could be…or not! I found it at Goodwill this morning. I was there as they opened the doors and five of us trooped in. Instead of starting down my usual aisle (dishware), a voice in my head said, “Go to the art wall.” So I did! 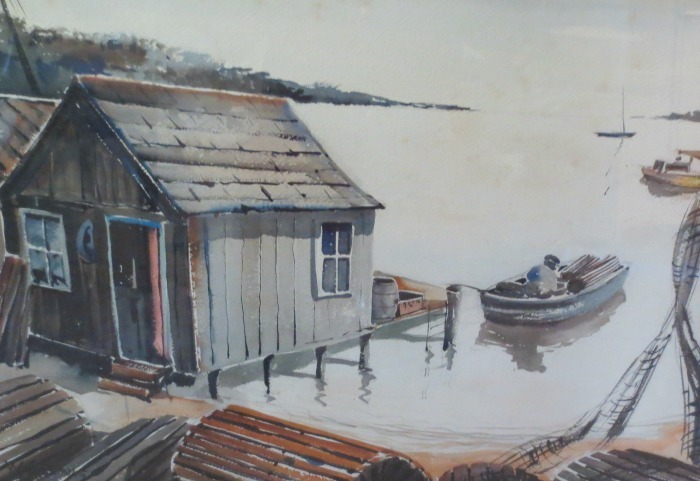 And sure enough, mixed with all the posters and mass-produced “art” were two original watercolor paintings. Hallelujah! Both were water pictures, but one had a more interesting subject matter. I looked up both artists and didn’t find anything of use. Hmmm. Both were big which makes shipping a pain in the tuckus. And, alas, the more appealing one had a bit of foxing and water damage, mostly on the matting. Hmmm. Both had been put out just yesterday and I knew wouldn’t last long. Okay. Okay. I grabbed my favorite one (all 32″ by 24″ of it) and had the salesclerk put it on hold for me behind the counter. 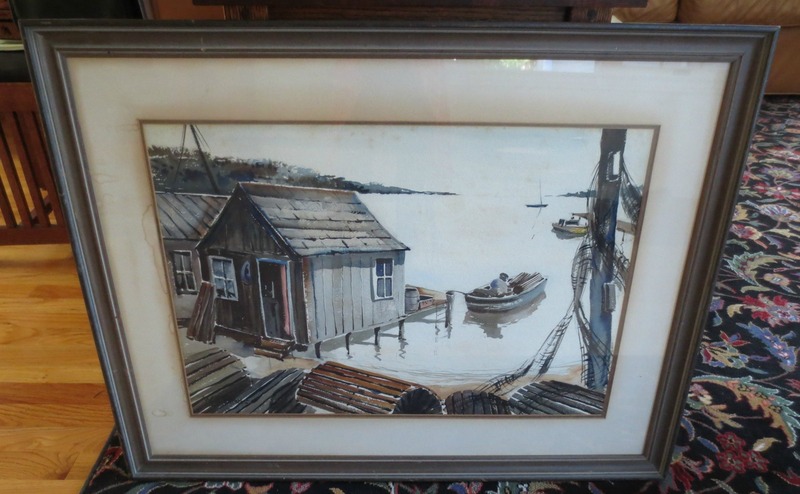 The painting is of a bay (in Maine?) with fishing boats, a shack and lobster traps. It’s by W.G. Evans and was framed by Ferdinand Roten, an art gallery in Baltimore. Have I got a winner with this watercolor? I don’t know. But at least it’s a real painting showing some skill and I can almost smell the sea and fish. I love it! Thumbs up! Thumbs Up!! Happy for you.